Afternoon fishing fans! 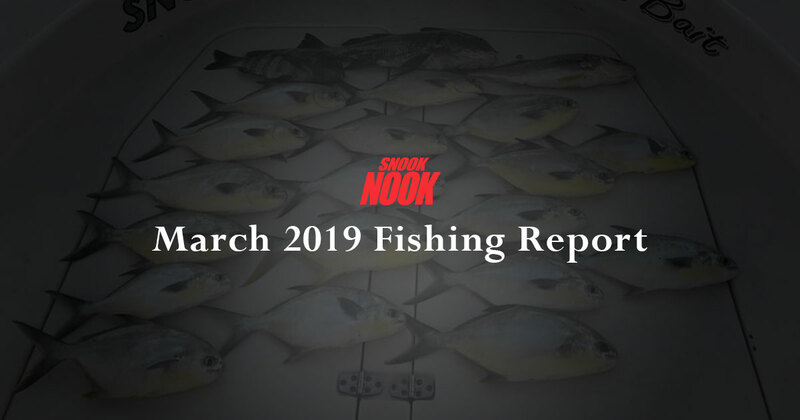 Just wanted to give everyone a quick fishing report along with some specials going on here at the Snook Nook! Fishing has been excellent, unfortunately, the weatherman hasn’t given us too many picture perfect days. On the days when the wind isn’t swirling to the tune of 15+ knots, anglers have been doing quite a bit of catching. From record-breaking sailfish numbers to limits of pompano, fishing has been that good. Now if only we could get mother nature to cooperate on a more consistent basis. Fortunately, it looks like this upcoming weekend is going to be a good one. The fishing up and down the Indian River has yielded Black Drum, Sheepshead, Pompano, Redfish, Snook and even a stellar showing of Bonefish. Fishing around the St. Lucie Inlet anglers have still reported catches of Bluefish and Mackerel as well. For the Pompano, jigs in the pink and chartreuse colors have been the ticket. The most important thing with these jigs is to make sure you have the correct weight to reach the bottom, typically 3/8oz to 1/2oz. A good indicator that your jig is not reaching the bottom is if you are catching nothing but ladyfish, jacks and bluerunners as they tend to feed above the pompano. For the blues and macs anything chrome or green, spoons and jigs worked quickly will get bites. Coming up river and fishing along the docks on the west side north of the Jensen Causeway, that’s where you will find the Redfish. Soft plastics and live shrimp fished on a 1/4oz jig head will do the trick. Before the wind started blowing we saw an excellent showing of Threadfins just outside the inlet. A green number 8sabiki will catch them but bring more than a couple, the mackerel are still there to take them from you. After record numbers of sailfish to start the season its been lackluster up until just recently. A few nice Kings and Mahi but the highlight has been the start of our Cobia season. They hang around the pods of bait and shallow reefs, easily taking interest in a live bait or a 2oz Jig. They are a hard fighter and make excellent table fare, thus making them a favorite among offshore anglers. They are a very opportunistic feeder, mostly following sharks, rays and turtles looking for scraps or whatever gets kicked up off the bottom. Now for all the Snook Anglers out there, we have a great deal for you! If you throw artificial baits for Snook chances are you have heard of the Spooltek Lure. A very innovative bait as it has a soft plastic tail and a concealed cable leader in a hard plastic head that deploys when you get a bite. For structure based anglers this has become crucial for maneuvering large fish away from the concrete. Due to recent packaging changes we were able to get a hold of a large supply of these baits at a discount, we would like to pass on to you. Were offering a number of different package deals so whether you are already throwing them or have been waiting to try them out this is the time. Click here to take a look! Owner of The Snook Nook located in Jensen Beach, FL.